Thank you. It is an honor to be here with all of you on what is really in some ways quite a solemn occasion. 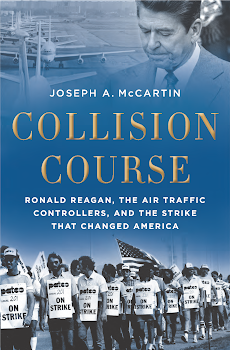 Thirty years ago, at around this hour you and your colleagues began to gather in your cluster meetings, as your negotiators sat down across the table from President Ronald Reagan’s representatives in the offices of the Federal Mediation and Conciliation Service in Washington. Having now interviewed more than 100 of you, having spoken with members of your leadership then, the mediators, and the Reagan Administration’s key representatives, I can say that everyone concerned already knew at this time thirty years ago that what was about to happen could be momentous. But, of course, no one then knew exactly how momentous it would be. The weapon that was unleashed 30 years ago tonight did shake the world. But not in the ways that Domenic and most others in your cluster meetings imagined. Thirty years ago you all went on strike, hoping to make a huge breakthrough: showing by shutting down the nation’s air traffic that the government had to deal with you collectively, as one; that it had to negotiate with you in a way that you felt honored your dignity and professionalism. Your strike was illegal. You knew that. But most of you saw it as an act of civil disobedience – part of a long struggle by government workers to win rights to bargain collectively. As far back as 1962 the federal government had offered the promise of collective bargaining to federal workers; but, as you and your predecessors discovered, it was a limited promise. The key things that you felt were crucial to your wellbeing as professionals – especially your salaries – were not negotiable under federal law. You wanted to change that in a big way. But even more, most of you wanted to show how important you and the work you did – behind the tinted glass of control towers, bent over glowing radar screens in windowless control centers — was to the life of the country. I learned that most of you saw yourselves as patriots; most of you had served your country in uniform, many of you had done that service in the nation’s tragic, unpopular war in Vietnam. By walking off your jobs you hoped to win respect. You wanted to make a point. Your strike did make a point. Unfortunately, it was not the one you wanted to make. The breaking of your strike instead made a dangerous point, and one that lingered long after 1981, the point that strikes – even by highly skilled workers – could be broken if employers had the nerve to break them. The destruction of your union legitimized strikebreaking all through our economy. In the years after 1981, private employers repeatedly pointed to the breaking of PATCO as an example of what they should do when their workers struck. The copper miners of Phelps Dodge, the meatpackers of Hormel, the bus drivers of Greyhound, the mill workers of International Paper. All of them saw their unions broken just as yours was broken. In the years after 1981, your story became the nightmare of American workers in general. The ghost of PATCO haunted American labor relations for many years. Indeed, in some ways, it haunts our labor relations still. Today, we live in a very different country than you did 30 years ago. Then, more than 20 percent of American workers were in unions. Today less than 7 percent of the private sector is organized. Then, government workers’ unions were the cutting edge of the labor movement. Your strike was in many ways the culmination of a 20-year expansion of the public sector labor movement. Today, with private sector unions enfeebled, government workers’ unions are surrounded and besieged by angry anti-union forces. Thirty years ago, the question you asked was: How do we expand collective bargaining in the public sector? Today, the question other union members ask is far more basic: Can we save collective bargaining at all? As we meet tonight, all across this country efforts to roll back collective bargaining are underway. The very future of the union movement is at stake. It is a very different fight than the one you waged thirty years ago. But it is not disconnected from your experience. Indeed, in many ways, your experience helped trigger a cascade of developments that have brought us to this point. And so it is all the more important that in this crucial moment, as we stand at this crossroads for our nation, we turn back to your story and reconsider its meaning. It is in some ways not a pretty story. Clearly PATCO made mistakes, and I don’t think anyone here would disagree with that. But those mistakes shouldn’t obscure a larger truth. Your story is the story of people who risked everything, and lost much, because they believed that no nation could long call itself a democracy, if it did not provide ways and means for its working people to have a say over some of the most vital things in their lives, the terms and conditions under which they worked. That was the point you tried to make then. That point was obscured by your confrontation with Ronald Reagan, the illegality of your strike, and your leaders’ mistakes. Nonetheless, it is a point worth remembering. Indeed, it is a point that we badly need to reconsider today, as we stand mired in the worst economic downturn since the Great Depression and after many years in which workers’ incomes have stagnated while their productivity rises and their employers’ profits grow. Without collective bargaining, workers simply lack the leverage to get a fair share of the wealth their hard labor helps create. And so as they get up and go to work they work each day, workers see this nation becoming more and more unequal. We simply cannot continue on this unsustainable path. When I went to work at LAX TRACon I had crossed the picket line because I needed a job while I knew that my brothers had lost their jobs. It was a pain and guilt that I never forgot. The issues at LAX were about equipment and working conditions. There were parts of the Los Angeles Basin that radar coverage was "lost" a black hole so to speak. The volume of VFR and IFR crisscrossing was mind boggling. Near misses were a daily occurrence. That all came to a head with the Cerritos crash. The top of the Terminal Control Area was 7,000 feet when an iFR Jetliner and a small single engine cessna with no mode-C transponder collided bringing all down in a fiery crash. That was what the controllers that walked at LAX wanted fixed was the Radar.